Many of us have created basic forts in our childhood bedrooms using pillows, sheets, and stuffed toys. 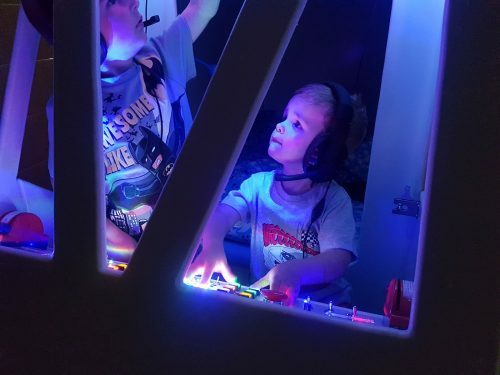 Pete Dearing’s sons, meanwhile, get to play and sleep in an incredible spaceship bunk bed. 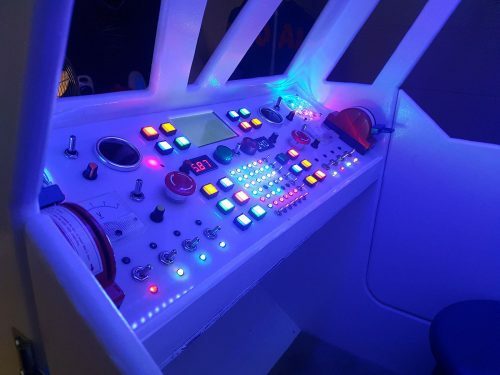 A spaceship bunk bed with functional lights, levers, buttons, and knobs. I’m not jealous at all. All the best beds have LEDs. Pete purchased plans for a spacecraft-shaped bunk bed online, and set out to build its MDF frame. 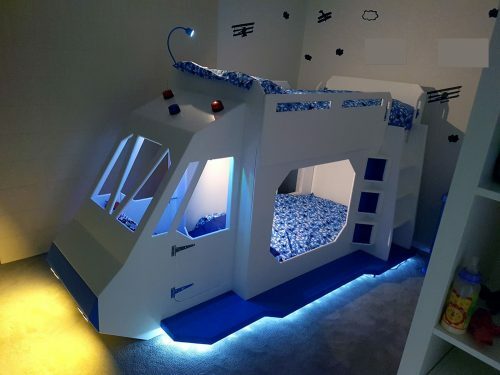 Now, I don’t know about you, but for young me, having a bunk bed shaped like a spaceship would have been enough – tiny humans have such incredible imagination. But it wasn’t enough for Pete. He had witnessed his children’s obsession with elevator buttons, mobile phones, and the small control panel he’d made for them using switches and an old tool box. He knew he had to go big or go home. 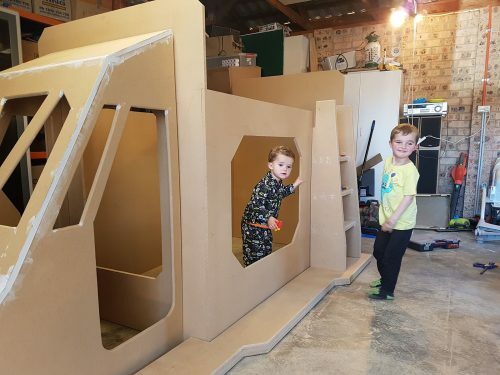 While he was cutting out pieces for the bed frame, Pete asked the boys some creative input, and then adjusted the bed’s plans to include a functional cockpit and extra storage (for moon boots, spacesuits, and flags for staking claims, no doubt). After realising he hadn’t made enough allowance for the space taken up by the cockpit’s dials, levers, and switches, Pete struggled a little to fit everything in place inside the bunk bed. But it all worked out, and the results were lights, buttons, and fun aplenty. Finally, as icing on the build’s proverbial cake, Pete added sound effects, powered by a Raspberry Pi, and headsets fitted with microphones. The electronics of the build run on a 12V power supply. To ensure his boys’ safety, and so that they will actually be able to sleep, Pete integrated a timer for the bed’s ‘entertainment system’. Find more information about the spaceship bunk bed and photos of the project here. So where do I get mine? If you want to apply to be adopted by Pete, you can head to www.alex-is-first-in-line.com/seriously_me_first. Alternatively, you could build your own fantastic Pi-powered bed, and add lights and sounds of your choosing. How about a Yellow Submarine bed with a dashboard of Beatles songs? Or an X-Wing bed with flight and weapon controls? Oh, oh, how about a bed shaped like one of the cars from Jurassic Park, or like a Top Gun jet? Yup…I definitely need a new bed. While I go take measurements and get the power tools out, why not share your own ideas with us in the comments? Have you pimped your kid’s room with a Raspberry Pi (maybe like this)? Or do you have plans to incorporate lights and noise into something wonderful you’re making for a friend or relation? We want to know. And I want a spaceship bunk bed! Parenting – You’re doin’ it right! If you’re going to publish spoof URLs you should register them before someone else does that and cause you serious embarrassment. http://www.alex-is-first-in-line.com/seriously_me_first looks like it’s available. Ah ha – the mythic beasts have struck. Alex now has her URL. I’m actually crying with laughter over here. Well played! What have I done?! WHAT HAVE I STARTED?!??!?! Nice! What to do when the kids get too big? Hope the bed can be lengthened!